How do I design and build a sauna? 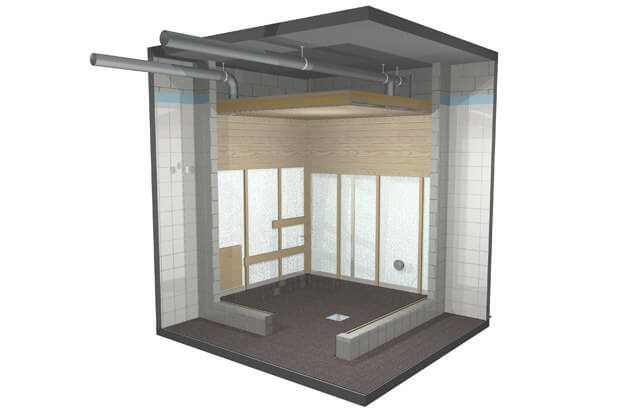 These instructions are designed to give you basic information about the structure and building stages of a sauna. In these instructions, the sauna is built into a ready-made room with walls made of concrete blocks and a tiled floor. The ventilation system is mechanical. The walls are panelled throughout in order to keep the heater power at a moderate level. However, a glass door is installed – when determining the right heater power level, the door must be taken into account as 1.5 m3 of additional room volume. Carefully read the heater installation instructions, especially the safety distances. No combustible materials may be located inside the indicated safety distances. Not adhering to the safety distances causes a fire hazard. The safety distances of a wood-heated stove can be reduced with a protective sheath (see the stove installation instructions). If the electric heater features an external sensor, you must be able to place it precisely as prescribed in the installation instructions. 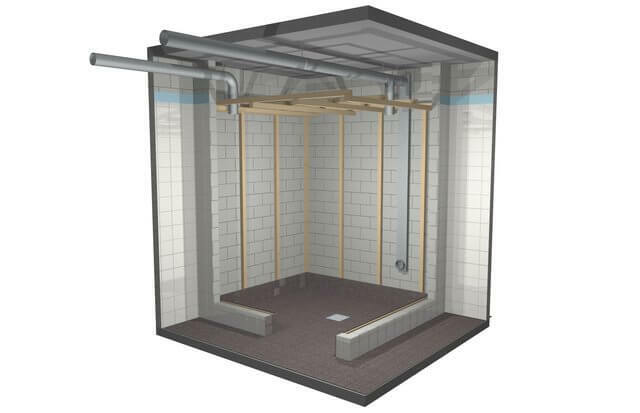 If you have chosen a Combi heater with a steamer, the sauna room must have a floor drain. If you choose a Combi model with automated water dispensing, there must be a water supply near the heater. Furthermore, when planning the electrical wiring, it must be taken into consideration that Combi heaters are always controlled with a separate control panel. Familiarise yourself with the wiring required by the lights, the heater and the control panel or unit and decide whether you want to have the cables under or on the panelling boards. These instructions describe the installation of straight Formula benches. 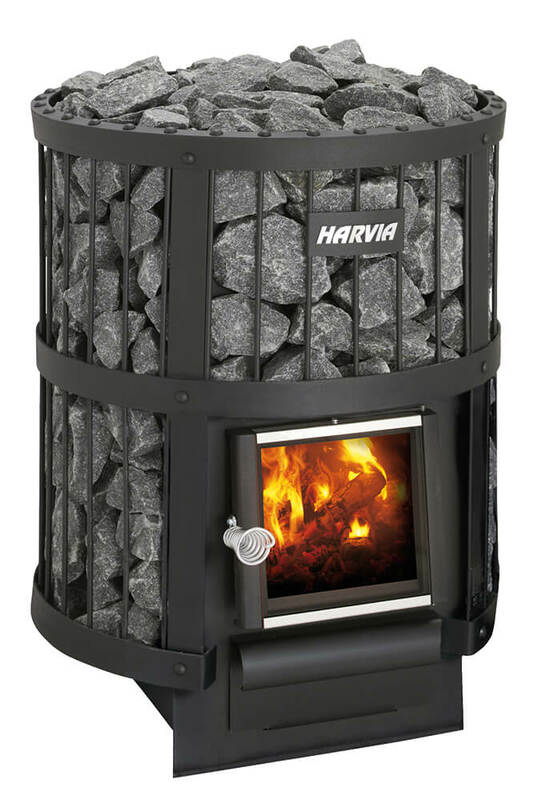 Harvia offers a wide selection of bench models, see more here. Note that the bench supports require reinforcements in the walls. The locations of the supports depend on the chosen bench model. Waterproof the floor in accordance with building regulations. When selecting the flooring material, note that water thrown onto the heater washes off eroded stone that may stain white materials. Therefore, we recommend choosing a dark flooring. Pillar heaters must always be installed onto a non-combustible floor, as hot stone fragments may fall through the steel frame. The flooring material must also cover 10–20 cm of the walls. You can attach the material either directly onto the wall or onto plywood attached to the wall. A. Placement of the supply air vent. If mechanical exhaust ventilation is used, place the supply air vent above the heater. If gravity exhaust ventilation is used, place the supply air vent below or next to the heater. The diameter of the supply air pipe must be 50–100 mm. Heaters with a separate temperature sensor: the supply air vent of the sauna must not be near the temperature sensor! B. Exhaust air vent. Place the exhaust air vent near the floor, as far away from the heater as possible. The diameter of the exhaust air pipe should be twice the diameter of the supply air pipe. If the exhaust air vent is in the washroom, the gap underneath the sauna door must be at least 100 mm. Mechanical exhaust ventilation must therefore be used. C. Optional vent for drying (closed during heating and bathing). The sauna can also be dried by leaving the door open after bathing. Attach framing studs (50 x 50 mm) to the walls. Space the studs by 600 mm or in accordance with the width of the insulation material. Attach the ceiling frames to the wall frames. 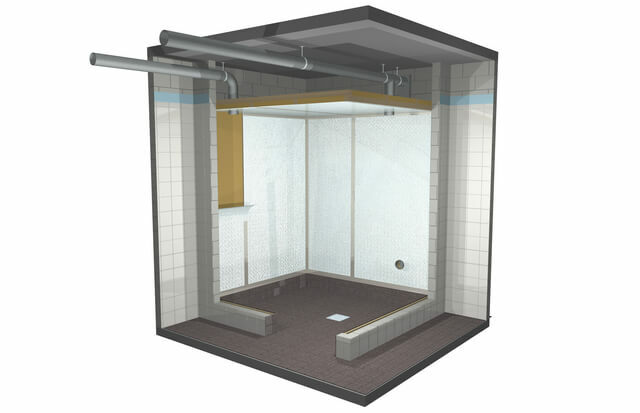 The room height of a sauna is typically 2,100–2,300 mm. The minimum height depends on the heater. The distance between the upper bench and the ceiling should not exceed 1,200 mm. Set the insulation materials between the framing studs. Make sure that there are no gaps in the insulation. The ceiling insulation is a particularly significant factor in energy efficiency, so install a double insulation (at least 100 mm) to the ceiling. The purpose of aluminium foil used as humidity proofing is to keep the humidity inside the sauna. The humidity proofing must be sealed throughout in order to prevent humidity from entering the structures. The aluminium foil is attached sparsely with staples, for example. Set the shiny side of the foil towards the sauna interior. First, attach the aluminium foil to the ceiling and fold the edges onto the walls, so that the ceiling and wall foils overlap well. Tape the seams carefully with aluminium tape. Install the aluminium foil onto the walls and tape the seams. We do not recommend placing seams in corners, as this makes the taping more difficult. Tape the lower edges of the aluminium foil onto the upper edge of the floor tiling or onto the waterproofing. Tape all feed-through openings so that they are sealed! Attach nailing battens (e.g. 22 x 50 mm) onto the ceiling where the framing studs are placed. Attach battens onto the walls. Measure the battens so that the upper ends are approximately 20 mm below the ceiling battens. The battens must be installed vertically to allow air to travel up from the bottom behind the panelling boards. If you wish to install the panelling boards vertically, install another set of battens horizontally onto the vertical battens. Check the bench heights from your bench plan and install reinforcements into the planned locations on the bench support attachments. Build the reinforcements from wood that matches the thickness of the nailing battens. The width can be 90 mm, for example. Attach the reinforcements to the frame. If you have chosen a wall-mounted heater, install a support (A) onto the wall for the heater mounting screws. The support can be made of plywood, for example. See the heater’s instruction manual for the locations of the mounting screws. Nail the panelling boards onto the nailing battens. Begin from the ceiling. Nail a few rows of panelling boards onto one wall and then move on to the next wall. By going around like this, you can make sure that any width differences in the panelling boards do not affect the end result. Drill holes for the electrical wires into the boards where needed, and insert the wires through the holes. Leave an air gap of a few millimetres between the upper edge of the panelling boards and the ceiling. Install the bench supports in accordance with the bench plan. We recommend installing the light at this stage (if necessary, turn to a professional electrical engineer). Lift the benches onto the bench supports. Follow the installation instructions supplied with the benches. Install and connect the heater in accordance with the installation instructions. I am about to start panelling my sauna – what do I need to take into account? 1. If you have selected a wall-mounted heater, there needs to be a supporting structure for it behind the panelling boards. The mounting screws will not hold on panelling boards alone and the heater may fall onto the floor. In practice, sturdy boards for the mounting screws or a similar solution will suffice as a supporting structure. See the heater’s instruction manual for the locations of the mounting screws. 2. Familiarise yourself with the wiring required by the lights, the heater and the control unit (if one is used) and decide whether you want to have the cables under or on the panelling boards. 3. Note that the benches require supports on the walls. There must be sturdy supporting structures behind the panelling boards for the bench supports. The air in the sauna should change six times per hour. A. Placement of the supply air vent. If mechanical exhaust ventilation is used, place the supply air vent above the heater. If gravity exhaust ventilation is used, place the supply air vent below or next to the heater. The diameter of the supply air pipe must be 50–100 mm. Heaters with a separate temperature sensor: the supply air vent of the sauna must not be near the temperature sensor! For more detailed instructions, see the heater installation instructions. B. Exhaust air vent. Place the exhaust air vent near the floor, as far away from the heater as possible. The diameter of the exhaust air pipe should be twice the diameter of the supply air pipe. D. If the exhaust air vent is in the washroom, the gap underneath the sauna door must be at least 100 mm. Mechanical exhaust ventilation must be used. B. its outlet should be as far away from the stove as possible, and near the roof. The stove itself circulates air effectively; the purpose of the outlet is mainly to remove humidity from the sauna after bathing. B. the outlet should be close to the floor, e.g. under the benches. How do I select the correct heater power? The volume and structures of the sauna affect the selection of heater power. An average of 1 kW of heater power is required for each cubic metre of sauna volume. The power requirement increases if there are window surfaces or heat-storing surfaces such as brick, concrete or massive logs in the sauna. One square metre of stone, glass or similar non-insulated surface increases the heater power requirement as much as if the sauna room volume were increased by 1.2 cubic metres. 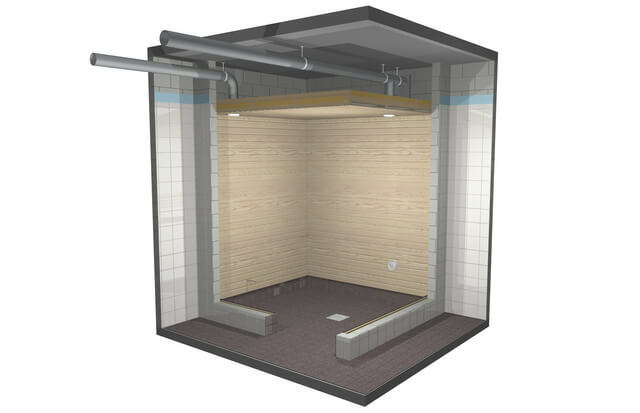 If the interior walls of the sauna room are made of non-insulated logs, the corresponding factor is 1.5. If the heating capacity is too small, the heater needs to be heated longer and more intensely, which reduces its life span. How much space does the heater require around it? All heaters have specific safety distances that determine how close the heater can be placed to walls and benches made of combustible materials. Greater heater power often corresponds with greater safety distances. The safety distance values can be found on the rating plate, the installation instructions, the brochure and the online product page of the heater. The minimum safety distances must be adhered to in order to avoid fires! The fixed, mechanical operating switches are placed on a side or at the top or the bottom of the heater. If you wish to avoid bending down or your bench solution prevents manual access to the heater, you can select a heater model that is equipped with an external control panel or control unit. The external control panel can be installed in the dressing room, for example – it also shows the temperature of the sauna. External control units are necessary for large heaters used in public facilities, but they are also well-suited for home use (consult your electrical engineer first). Which control unit should I select? External control units are necessary for large heaters used in public facilities, but they are also well-suited for home use as long as the required electrical and sensor wiring is taken into account when planning the sauna. Many heaters intended for home use are also available as so-called E models that utilise a control unit instead of operating switches on the heater. This is especially convenient when the heater is embedded into a bench. Can anyone connect an electric heater to the power grid? All electrical appliances that are fitted with a protective housing, that is attached by screws to prevent dangerous live components from coming into contact with one another, must be installed and serviced, in compliance with the regulations in place, by a professional, authorised electrical engineer or any such other knowledgeable person. Can anyone replace a broken heating element? All electrical appliances that are fitted with a protective housing that is attached by screws to prevent dangerous live components from coming into contact with one another must be installed and serviced, in compliance with the regulations in place, by a professional, authorised electrical engineer or any such other knowledgeable person. Why is a connection cable not supplied with the heater? A connection cable between the junction box on the sauna wall and the terminal strip of the heater is not supplied with the heater. The electrical engineer who connects the heater will supply the cable. The information of the connection cable can be found in the installation instructions of the heater and/or control unit. Where can I install a digital control panel for the heater? The control panel is splash-proof and has a low voltage. It can be installed in the washroom, the dressing room or the living area, for example. If the control panel is installed in the sauna, it should be placed no closer than the minimum safety distance from the heater and no higher than one metre from the floor. Keep out of reach of children. Can an electric heater be equipped with mobile phone-operated remote control? The sauna must always be checked before the heater is turned on. This is to make sure that no combustible objects are left near or on the heater. If you wish to have your sauna ready quickly, we recommend a heat-storing Forte heater. Can the heater’s electrical circuit be fitted with a fault current protector? A fault current protector must not be installed into the heater’s electrical circuit, as the heater is sufficiently protected when earthed. Fault current protectors are designed to ensure the safety of small electrical appliances, such as a coffee maker. The silicone cable supplied with the sensor can withstand temperatures up to 170 °C. The cable can be extended with a lower temperature value cable with an equivalent cross section, provided that the temperature affecting the cable after the connection does not exceed 80 °C. The sensor must be placed exactly as prescribed in the instruction manual in order to ensure that the heater works correctly. If the minimum distance cannot be adhered to, the ventilation system must be altered. Even the smallest wood-heated stoves are equal to a 13 kW heater in terms of heating power. If you wish to install an electric heater to accompany a wood-heated stove in your sauna, the power of the heater must be selected carefully in accordance with the directions provided by the factory. The safety distance requirements for both the heater and the stove must be met. See the installation instructions of the heater and the stove for the safety distance requirements. The distance between the heater and the stove must be their respective safety distances combined, however no less than 600 mm. This safety distance can be reduced with a protective sheath for the wood-heated stove. Forte: The thermocouple circuit is broken. Moderna, Fuga, Delta, Kivi, Cilindro: The measuring circuit of the temperature sensor is broken. Contact service. Moderna, Fuga, Delta, Kivi, Cilindro: Short-circuit in the measuring circuit of the temperature sensor. Contact service. Forte: The measuring circuit of the overheat protector is broken. Forte: Disrupted connection between the lower and upper card. Forte: The temperature surrounding the control panel is too high. Applies to heaters with a mechanical timer switch. Make sure that the fuses/breakers of the heater on the electrical panel are in working order. Please note that there are one to three fuses/breakers on the electrical panel, depending on the heater model and electricity system. Make sure that the connection cable of the heater is connected. Make sure that the overheat protector has not been triggered. In that case, the timer works, but the heater will not heat up. Water thrown on the heater cools the stones quickly. Check that all the heating elements are glowing when the heater is on. Make sure that the heater is sufficiently powerful. Check the heater stones. If the stones are stacked too tightly, compacted over time or the wrong kind, air circulation in the heater may be blocked, which in turn decreases the heating power. Make sure that the ventilation of the sauna is arranged correctly. Remove stones from the heater until you can see the ends of all heating elements. Turn the heater on. The heating elements will begin to glow. If a heating element does not glow, it must be replaced. Remember to close the sauna door. Monitor when the heating elements turn off. This happens when the sauna temperature has reached the desired temperature set with the thermostat. Usually, the desired temperature will be reached in 35–45 minutes from turning on the heater. If it takes significantly longer to reach the desired temperature, the temperature sensor may be placed incorrectly, the heater may not have enough power, or the thermostat may be faulty. Check the data cable and its connections. Water thrown onto the heater does not vaporise and runs through the stone compartment. Make sure that the heater is not too powerful. Make sure that the safety distance requirements are met. Check the heater stones. If the stones are stacked too tightly, compacted over time or the wrong kind, air circulation in the heater may be blocked, which can cause overheating in the structures (especially when an electric heater is used). If the heater is new, it may still have residual protective agents from the manufacturing process. Carry out the first heating in a well-ventilated room. The hot heater may emphasise smells mixed in the air that are not, however, caused by the sauna or the heater. Examples: paint, glue, heating oil, spices. The timer switch is a mechanical device that emits a ticking sound when working normally. If you hear ticking even though the heater is off, check the connections of the timer switch. Occasional bangs are usually caused by stones splitting due to the heat. Thermal expansion in the heater parts may cause sounds when the heater is heating up. The health effects of an infrared cabin are comparable to those of exercising. In fact, many people use an infrared cabin for refreshment and muscle recovery. Finns may find it hard to believe that, on a global scale, infrared cabins sell more than traditional saunas. However, infrared heat treatment appears to have become a growing global trend that is gaining popularity in Finland as well. Infrared cabins are used at locations such as spas, hotels and beauty parlours, and increasingly more at private homes. An infrared cabin can be easily installed without a separate building permit in any dry space, such as the bedroom of an apartment. Even though the conventional sauna and the infrared cabin have many factors in common, such as the fact that both are used for sweating and relaxing, there are also many differences between the two. For example, according to some estimates, infrared cabins cause three times the amount of sweating compared to conventional saunas. This is because the long-wave deep heat from an infrared radiator goes approximately four centimetres deep, causing perspiration from deep within the tissues. In a conventional sauna, the heat is transferred to the human body by air. In an infrared cabin, however, the infrared directly warms the tissues of the body. The roots of the infrared cabin are in early 20th century America, but the concept of the modern infrared cabin was created in Japan in 1965. In recent decades, Japanese and Chinese researchers have studied infrared treatments extensively. In Finland, relatively little research has been conducted on infrared cabins, but information regarding its health effects has made its way here. Today, very few people have the misconception that infrared has anything to do with harmful ultraviolet radiation. Instead, infrared is associated with muscle relaxation, increased metabolism and blood circulation and the elimination of toxins and cellulite. Many people are surprised to learn that unlike the conventional sauna, which serves as a natural sleeping aid for many, infrared has an energising effect. It is also said that using an infrared cabin for 30 minutes can burn up to 300–600 calories. Infrared heat can also help with the symptoms of many diseases. Especially people suffering from arthritis and fibromyalgia have found relief in infrared heat. A recent American study* indicates that people suffering from both rheumatoid arthritis and ankylosing spondylitis had less pain and stiffness due to infrared heat. Skin conditions are also often treated in an infrared cabin. It appears that infrared heat can also help the body battle flu viruses, among other things. The deep heat of an infrared cabin has been said to raise the user’s body temperature, creating an artificial fever of sorts. Fever is known to be the body’s natural reaction to an infection. Because infrared heat energises and accelerates vital functions, it serves as an excellent form of warming up before exercise. After exercise, the infrared heat aids muscle recovery and relaxation. One athlete who uses an infrared cabin for recovery after a hard workout is former sprinter and current active exerciser Johanna Manninen. “The infrared heat goes deep into the muscles and relaxes them after the strain of exercising. I’ve noticed that it reduces muscle soreness and alleviates aches. I feel like the infrared heat also increases my metabolism and cleanses my body,” Johanna says. Johanna’s home is equipped with an infrared cabin as well as a sauna with a heat-storing heater. She also has a traditional wood-heated lakeshore sauna. The infrared cabin has not replaced the traditional sauna for her. How do I use an infrared cabin? The infrared cabin will be ready for use in less than 10 minutes. Protect the benches and floor of the infrared cabin with towels, as you will sweat profusely. The infrared heat works best on bare skin. Wearing a towel, for example, partially prevents the good heat from being transferred to your tissues. Depending on your preferences, you can safely use the infrared cabin on a daily basis. Discuss using the infrared cabin with your doctor if you are pregnant or you have health problems (or a pacemaker, artificial joints or other surgical implants). Many heaters intended for home use are also available as so-called E-models that utilise a control unit instead of operating switches on the heater. This is especially convenient when the heater is embedded into a bench. Griffin, Xenio, Xafir: The measuring circuit of the temperature sensor is broken. Contact service. Griffin, Xenio, Xafir: Short-circuit in the measuring circuit of the temperature sensor. Contact service. Griffin, Xenio, Xafir: The measuring circuit of the overheat protector is broken. Press the overheat protector restoration button. Contact service. Griffin, Xenio, Xafir: Disruption in the temperature-measuring component of an additional sensor. Contact service. Griffin, Xenio, Xafir (Combi control units): Disruption in the temperature-measuring component of the humidity sensor. Contact service. Griffin, Xenio, Xafir (Combi control units): Disruption in the humidity-measuring component of the humidity sensor. Contact service. Griffin, Xenio, Xafir (Combi control units): The humidity-measuring circuit of the humidity sensor is broken. Contact service. Griffin, Xenio, Xafir: Connection disruption in the system. Check the wiring. Contact service. C150: The temperature is outside the measuring range or the measuring circuit of the temperature sensor is broken. The heater normally heats up for 15 minutes to bring the temperature up to the measuring range. If the temperature does not rise to the measuring range within this time or the measuring circuit is broken, the error message ER1 is displayed. C150, C105S: The measuring circuit of the temperature sensor is broken. Contact service. C150, C105S: Short-circuit in the measuring circuit of the temperature sensor. Contact service. C150, C105S: The measuring circuit of the overheat protector is broken. Press the overheat protector restoration button. Contact service. C105S: The measuring circuit of the temperature sensor of the humidity sensor is broken. Contact service. C105S: Short-circuit in the measuring circuit of the temperature sensor of the humidity sensor. Contact service. The displayed humidity value does not change from the set humidity value. C105S: Check the sensor wiring. Contact service. The brick flue is cold. Burn a few newspaper sheets through the sweeping opening in the lower duct of the flue to start the draught. There is low pressure in the room caused by an extractor fan, another fireplace or other device. Ensure sufficient make-up air: stop the extractor fan/mechanical ventilation or open a window when lighting a fire. The ash box is full. A full ash box prevents air circulation within the stove. Empty the ash box. There are leaks in the flue connection. Seal the connection. The smoke ducts of the stove are blocked. Clear the smoke ducts through the sweeping openings of the stove. The flue connection pipe is too deep in the flue. Shorten the flue connection pipe and/or pull the stove and the pipe further from the flue. The sauna is too large in relation to the stove’s heating capacity. See the stove selection instructions. There is a lot of non-insulated wall surface in the sauna. See the stove selection instructions. The burning material is moist or its quality is otherwise low. The flue does not have a good draught. The smoke ducts of the stove are blocked. Clear the smoke ducts. The sauna is too small in relation to the stove’s heating capacity. See the stove selection instructions. Check how the stones are stacked. Remove small pieces of stone and stones that are less than 10 cm in diameter from the stone compartment. Replace disintegrated stones with large and undamaged ones. If the stove is new, it may still have residual protective paint on its body. Carry out the first heating outside – more information in the installation and user instructions of the stove. The hot stove may emphasise smells mixed in the air that are not, however, caused by the sauna or the stove. Examples: paint, glue, heating oil, spices. Please note! Remember to always check the sauna before heating. No unwanted objects must be left on or near the heater. Never dry your laundry in the sauna. Remember to always check the sauna before heating. No unwanted objects must be left on or near the heater. Never dry your laundry in the sauna. Turning the heater on immediately. Turn the timer switch to the operation area (scale A, 0–4 hours). The heater will begin to heat up. The heater will turn off as soon as the timer machinery returns the switch to 0. You can turn the heater off at any time by manually turning the switch back to 0. Turning the heater on with the timer. Turn the timer switch to the pre-set area (scale B, 0–8 hours). The heater will begin to heat up as soon as the timer machinery turns the switch to the operation area. The on-time will be approximately four hours. Example: You wish to go on a three-hour walk and have a sauna bath as soon as you come back. Turn the timer switch to 2 in the preset area. The timer will start. After two hours, the heater will begin to heat up. As the sauna takes about one hour to heat up, it will be ready for use in about three hours, i.e. right as you return from your walk. If the temperature gets too high, turn the thermostat counter-clockwise. If the temperature is not high enough, turn the thermostat clockwise. The heater is on standby when the backlight of the I/O button is on. If the backlight is off, make sure that the heater has been turned on with the main power switch at the bottom of the heater. Turn the heater on by pressing the I/O button on the control panel. The control panel will light up and the heater will begin to heat up immediately. 2. If necessary, adjust the temperature with the + and – buttons. After bathing, turn the heater off by pressing the I/O button. Turn the heater on by pressing the I/O button on the control panel. Press the MENU button twice. This enters a mode where you can change the remaining on-time. Press the + button. The heater will turn off and the timer indicator light will begin to flash. The panel shows the time after which the heating will begin. The time may be pre-set at 10-minute intervals up to 10 hours and at one-hour intervals from 10 to 18 hours. Press the MENU button and wait for the control panel to return to the default mode. Please note that the time shown on the panel will also count down at the aforementioned intervals. Can any stones be used as heater stones? Heater stones should be of a material that is as heavy as possible, dark in colour and large in size for them to be able to store as much heat energy as possible. Heater dealers sell stones that are specifically intended for use as heater stones, and that come from well-known suppliers, so their composition and suitability are guaranteed. Stone materials suitable for heater use include peridotite, olivine and olivine diabase. Surface rocks collected in nature are not suitable for heater use. Ceramic “stones” and soft soapstones must not be used. They do not store enough heat when heating up the heater. This may result in the heater overheating, which in turn leads to the heating elements breaking. The heater stones must be stacked in the heater in accordance with the installation and user instructions of the heater. Heater stones are available in two sizes. How often they are changed by and large depends on how much the heater is used. If it is an average of twice a week, the stones should be changed once a year. The stones should be restacked at times, as they will crumble in use and compact in the stone compartment, reducing the air circulation. Good air circulation guarantees a proper sauna experience. The heating elements will also last longer with good air circulation. What do I do when a heating element breaks? A broken heating element should be replaced immediately, as the ones that are still intact have to glow longer and one of the remaining heating elements may also break after a while. Only an authorised electrical engineer may replace a heating element. In any case, we recommend replacing all heating elements at once. The remaining working heating elements are probably near the end of their service life. If an electrical engineer is called to replace each heating element separately, the costs will multiply. Furthermore, stacking the stones – especially with heaters using a large amount – takes time as well. What is the correct sauna temperature? The temperature of the sauna must be set so that the user sweats while seated on the bench and feels comfortable. There is no right or wrong sauna temperature, as everyone has a different preference, taking age and state of health into account. If the sauna temperature is high (80–100 °C), the air may feel dry, even when it is humidified by throwing water onto the stones. The steam will feel sharp. In lower sauna temperatures (50–60 °C), you can use plenty of sauna water. The air will feel humid and soft. The combination of a low temperature and plenty of water works best when using a heater with a large amount of stones. You can use the control unit of a Combi heater to adjust a suitable air humidity level and temperature. However, the air humidity setting will determine the maximum temperature – high humidity in an extremely hot sauna can be a dangerous combination. Therefore, the system has a set limit that ensures safe and pleasant baths. 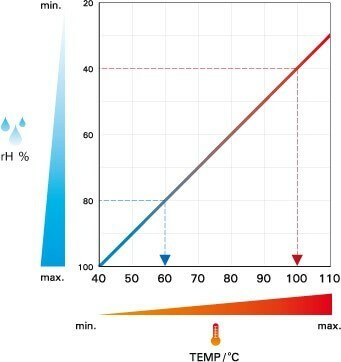 The maximum value is the temperature and humidity percentage sum of 140. Blue arrow in the chart: humid and soft steam. Red arrow in the chart: hot and sharp steam. Why does the steam feel hot on my skin? Water is thrown onto the heater stones to achieve a pleasant level of humidity in the sauna. Sometimes, if the sauna is very hot, the steam from the heater may feel too hot when it reaches the bathers. The reason for this is that, in accordance with the laws of physics, water vapour condensates on colder surfaces. In the sauna, the bather’s skin is colder than the wood surfaces of the sauna, for example. When the steam condensates into water, a lot of energy is released, which causes a hot or burning sensation on the skin. Can the materials of the heater cause unpleasant smells? When an electric heater is heated up for the first time, the residual protective and other agents accumulated in the heater during different work stages are removed. They can cause unpleasant smells and even smoke, which is why the sauna should be well-ventilated during the initial heating. Because of the possible unpleasant smells, bathing in the sauna during the first heating is not necessarily recommended. When a wood-heated stove is heated for the first time, the protective paint on the body of the stove burns off, which may cause a lot of smoke. The first heating should be carried out outside if possible. The hot heater may also emphasise other smells mixed in the air that are not, however, caused by the sauna or the heater. If you have recently carried out renovation work using paint, lacquer, glue or other agents with vaporising components (solvent fumes), even small amounts can cause a strong, “petrol-like” smell when mixed in the air and circulated through the hot stones and heating elements of the heater. The smell will dissipate when these agents have dried completely. Other similar smell sources can be your garage or oil filling tubing, or even spices used in cooking. Purchase some citric acid at a pharmacy, for example. Mix approximately two table spoons of citric acid powder in 500 ml of water. Wipe the stains with a towel dampened with the solution. Use rubber gloves, as the citric acid may irritate your skin. Rinse and dry if necessary. The heater is made of metal, and is therefore non-combustible. When installed in accordance with the instructions, the heater will not cause a fire hazard in the sauna. However, objects that fall or are left on the heater may catch fire. Objects that fall or are left on the heater may catch fire. Never dry your laundry in the sauna. Remember to always check the sauna before turning the heater on. Make sure that your smoke detectors are always in a working condition. Extinguish the fire with a dry powder extinguisher suitable for electrical fires. If a suitable extinguisher is not available, first disconnect power from the heater using the electrical panel of the house or apartment, then put out the fire with water. Please note that there are one to three fuses/breakers on the electrical panel, depending on the heater model and electricity system. A fire blanket rarely helps, as the fire receives air from under the heater. In any case, do not put yourself in danger. Call the emergency number 112. Exit the building and help others exit as well. Close all doors and windows as you exit. Can an electric heater give me an electric shock? Electric heaters are safe to use when installed correctly. Heaters are connected to the power grid in such a way that the metallic parts that are touched are earthed. Touching live parts is prevented by the structure of the heater. We recommend using paraffin oil for treating the sauna benches. Other wooden parts of the sauna, such as the door frame, a wooden door handle and the panelling boards, do not necessarily have to be treated, but if you wish to protect them against absorbed humidity and dirt, the treatment must be carried out using researched substances made for the purpose. Using lacquer on the interior surfaces of the sauna is strictly prohibited. The Harvia Sauna Care Set for treating the wood surfaces of the sauna includes a 500 ml bottle of paraffin oil, which is enough for treating 5‒10 m2 of surface area. The paraffin oil treatment also accentuates the colour of the wood. Test the oil on the bottom surface of a bench to see how the colour changes and whether the new colour pleases you. Wash yourself before entering the sauna. Always protect the bench with a bench towel or disposable bench covers. Wood surfaces usually withstand moisture dripping off the skin well without leaving marks. When using sauna fragrances, sauna honey or other care products, be careful not to stain the wood surfaces. Leaves from a sauna whisk must also be removed from wood surfaces within a reasonable time. Remove the bench covers and water bucket and dry off any water droplets. Use a damp cloth for cleaning. Keep the heater on for approximately 10 minutes to dry the wooden parts. Water traces should also be cleaned from the visible surfaces of the heater after use. Open the air vent and leave the sauna door half open. Cold outside air does not promote drying. Therefore, windows and outer wall valves should be closed for the drying when it is cold outside. A family sauna should be cleaned 1‒3 times a year with a moderate amount of water and detergent. Slightly alkaline (pH 8‒10) products are suitable detergents. You can also sand the surfaces lightly with sandpaper. The sauna must be dried using the heater and sufficient ventilation.